Assigned status Up to Date on December 10, 2018. Trabectome is an electrosurgical ab interno procedure to treat an elevated intraocular pressure (IOP). In the family of microincisional glaucoma surgeries (MIGS), Trabectome surgery molecularizes the primary barrier to outflow the trabecular meshwork (TM). Unlike in trabeculectomy, access to the TM and Schlemm’s canal (SC) is achieved through insertion of the Trabectome tip through a 1.6 mm clear-corneal incision and, therefore, the conjunctiva remains undisturbed. There is minimal heat dissipation to adjacent tissues. These factors contribute to the favorable safety profile of the procedure compared to more traditional glaucoma surgeries. The Trabectome device was invented by George Baerveldt of the University of California – Irvine and Roy S. Chuck of Montefiore Medical Center, with the associated patent being filed in 2002. The commercial device is manufactured by the NeoMedix Corporation (Tustin, CA) and is marketed for the “microsurgical management of adult and infantile glaucoma”. The device was cleared by the United States Food and Drug Administration (FDA) in April 2004. Initial cases were performed in Mexico, with the first procedures conducted in the US occurring in January 2006 for the treatment of open angle glaucoma. The Trabectome instrument utilizes a bipolar 550 kHz electrode, with adjustable power, to ablate the TM. Unlike in cautery, plasma generated here has a highly confined heat dissipation cone with minimal thermal transfer to the outer wall (about 1.2C). 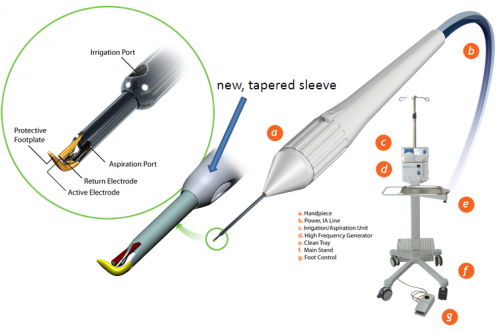 The device is equipped with a footplate that helps guide the electrosurgical tip and protect adjacent tissues. Constant infusion further helps to maintain the chamber and tissue debris is removed by aspiration through the shaft of the device. With over 50,000 documented cases over a decade since the initial FDA approval, the use of Trabectome has gained more widespread acceptance and its indications have broadened to include Trabectome after failed trabeculectomy and in narrow angles. The remainder of this article will discuss indications of the procedure, contraindications, the surgical technique, outcomes, and potential complications. Trabectome was conceived for the treatment of open-angle glaucoma in patients with uncontrolled IOP, with the likelihood of progressive nerve injury, on maximally available or tolerable medical treatment. However, because of the favorable risk profile of Trabectome compared to traditional filtering glaucoma surgery, the indications now include pseudoexfoliation, pigmentary, inflammatory,, steroid-induced, and angle closure glaucoma. Trabectome is also effective in failed trabeculectomy or tube shunts. [7, 13] Trabectome surgery can be combined with traditional tube shunt surgery to eliminate the need for tube fenestration. Trabectome surgery candidates can be phakic, pseudophakic or aphakic with a clear gonioscopic view of the angle. Patients must be able to rotate the neck or their axial core by about 30 degrees, and the microscope must have sufficient tilt of about 30 degrees. Trabectome surgery is often performed in combination with phacoemulsification in patients with a visually significant cataract who require further reduction of glaucoma medications or IOP. In a propensity score matched comparison of Baerveldt and Trabectome surgery and Ahmed and Trabectome surgery patients, patients with nearly identical preoperative variables do equally well, except a higher rate of complications and more medications that occurs in the tube shunts. The most common contraindications are active neovascular glaucoma, more than moderately active uveitis, elevated episcleral venous pressure, angle dysgenesis, and corneal edema or other opacities causing a poor gonioscopic view of the angle. Historically, a narrow anterior chamber angle has been considered a relative contraindication as there is less direct access to the TM, it is more difficult to visualize the TM, and it was thought that peripheral anterior synechiae (PAS), descemetization of the angle and fibrosis were more likely to occur. However, as more narrow-angle cases are performed and reported, there is growing data to support the safety and efficacy of the technique for both open- and narrow-angle cases. A low preoperative IOP may also be considered a contraindication or risk factor, as surgical success or failure is often determined by the postoperative IOP decrease. On the other hand, Trabectome surgery reduces diurnal IOP fluctuations by decreasing nocturnal peaks that are not measured during office visits. This means that glaucoma progression might stop despite a seemingly unchanged IOP obtained during office hours. As postoperative IOPs can be expected to fall typically to about 15-16 mmHg, due to episcleral venous pressure, low preoperative IOPs typically correlate with worse surgical outcomes. Another reported risk factor is age, with younger patients typically having worse outcomes. Cases with severe glaucoma could also benefit from Trabectome surgery. [20, 21] Such patients experience a relatively larger drop in IOP and the number of medications postoperatively. If the case requires both trabectome and phacoemulsification, the trabectome portion should be conducted first. The eye is pressurized with intracameral lidocaine or BSS through a paracentesis and the 1.6 mm iris-parallel clear-cornea and uniplanar main incision is made 2 mm anterior to the limbus to prevent iris prolapse. The inner third of the incision is flared to improve mobility of the handpiece and visualization by eliminating corneal striae from torque. In order to deepen the angle and enhance viewing, the irrigation bottle should be increased as high as determined to be safe for the stage of glaucoma with continuous irrigation. Viscoelastic should not be used to avoid optical interfaces and the trapping of ablation gas bubbles. In order to aid in position of the patient, the microscope tilt can be increased or the patient’s axial core rotated if they have significant difficulty with rotating their neck. After insertion of the Trabectome tip into the incision, the TM is engaged with the instrument at a 45˚ upward angle at the level of the scleral spur. It is more straightforward to begin ablation to the left of the main wound instead of directly opposite it (in a right-handed surgeon), as this allows a greater acute angle of contact between the Trabectome tip and the TM. When properly inserted, the TM should enter between the electrode tip and the footplate, causing the footplate to be obscured by the translucent TM. The leading, round, golden electrode should not directly press forward against the TM in ablation direction. During the procedure, it is crucial to eliminate any outward push on the SC as this can cause damage to the posterior wall of SC and collector channel orifices. It is therefore important to apply a slight inward pull during ablation to offset any tendency to push or rub outward against the SC with unnecessary force. Ablation should commence at an energy input of 0.8 mW and be increased as necessary. Coagulation necrosis can result with energies in excess of 1 mW, which manifest as darkening along the edge of the ablated tissue. This should be strictly avoided as it can initiate wound healing and associated complications including failure. Ablation of the first 60˚ can be achieved continuously without adjustments and an additional 30˚ can be completed by rotating the gonioscopy lens in the direction of the ablation while increasingly supinating the wrist. The tip is then disengaged and inverted downward away from the cornea so that ablation can proceed at the original starting point in the opposite direction. The target is to ablate 90˚ in each direction for a total of 180˚ per incision. Following a successful procedure, the outer wall of the SC will appear white. After completion of electrosurgery, the anterior chamber can be injected with a small amount of viscoelastic material to protect the ablation arc and minimize postoperative hyphema from flow back. Glaucoma medications can be discontinued following surgery. For a dropless postoperative follow-up, 0.1 ml undiluted moxifloxacin is injected under the iris and 0.3 ml triamcinolone (40 mg) is pushed into subconjunctival space. Otherwise, a moxifloxacin eye drops 4 times a day for 1 week and prednisolone acetate drop 4 times a day tapered off over one month could be used. In a pig model developed to assess the learning curve for Trabectome surgery, it was shown that although trainees needed 2.5 eyes to reach half-maximum performance in operating room compound score, it took 30 eyes to master the operation based on Fluorescent canalograms. 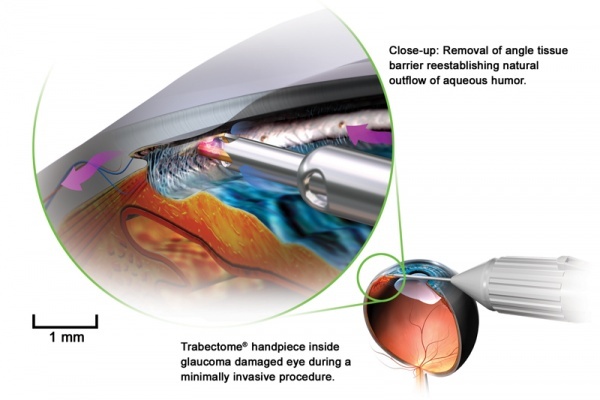 With over a decade of clinical experience in patients and thousands of documented cases reported in detail, Trabectome surgery continues to gain momentum due to its favorable risk profile with respect to traditional glaucoma surgeries. Because the definition of surgical failure varies between physicians and studies, in addition to being further confounded due to multiple procedures or varying postoperative care regimens, comparisons between studies can be challenging. However, the most common definitions of postoperative success are: (i) maintaining final IOP below a threshold value, typically 21 mmHg although the exact target value can vary between cases and physicians, (ii) a reduction from preoperative IOP, such as 20%, and (iii) maintenance of IOP on reduced number of glaucoma medications. The largest resource for researchers of Trabectome surgery outcomes is a repository, the Trabectome Study Group, maintained by the manufacturer that requires new participating surgeons to report data back for the first 20 cases performed, although reporting beyond this threshold and for extended postoperative outcomes is optional and, therefore, undoubtedly not representative of all cases performed. However, there has been considerable work in analyzing this database, and in smaller independent studies, to understand expected outcomes in different populations, risk factors, and other trends. Over those studies recently reviewed, typical outcomes over all patients of Trabectome or phaco-Trabectome showed an average IOP decrease of 18-40% (3.3-11.3 mmHg), with an average postoperative IOP of 15.3-17.4 mmHg, on up to 40% fewer medications. It is important to note that postoperative IOP achieved following Trabectome is not a function of preoperative pressure; therefore, patients with higher preoperative pressures typically have far better surgical outcomes with respect to pressure reduction than those with lower preoperative IOP. 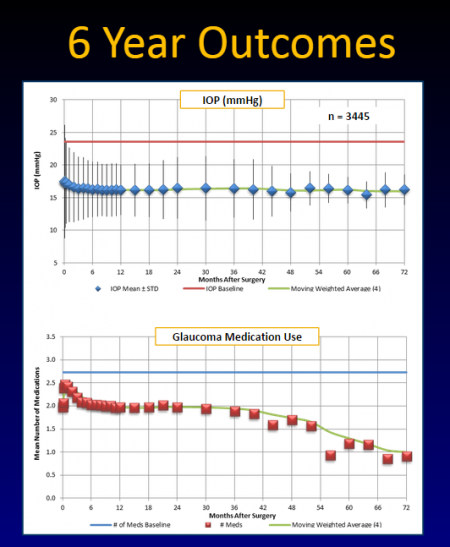 For example, one large study found that in patients with initial IOP greater than 30 mmHg, 6-month postoperative IOPs were reduced by 48% with a 25% reduction in medications, while those with initial IOP less than 17 mmHg only achieved a 7% decrease in IOP with a 35% reduction in medications.Therefore, in patients with lower initial IOPs, the procedure may be more effective at managing symptoms on fewer medications than actually lowering pressure. Phacoemulsification has only a small additional IOP lowering effect of 0.73±0.32 mmHg magnitude when combined with Trabectome surgery. [25, 26] In the case of steroid-induced glaucoma, Trabectome reduces baseline IOP of 33.8±6.9mm Hg and average preoperative glaucoma medication usage of 3.85±0.75 medications to 15.00±3.46mm Hg (P=0.03) and 2.3± 1.4 (P<0.01), respectively at one-year follow-up. Although patients with more severe open angle glaucoma had a three-fold larger reduction in IOP compared with mild glaucoma, the final success rate in advanced glaucoma was significantly lower than milder cases, 71% and 90%, respectively. The severity of glaucoma, age, Hispanic ethnicity, steroid-induced glaucoma, and C/D ratio are found to be significantly associated with IOP reduction. Severe complications are exceedingly rare and occur roughly with the same frequency as in cataract surgery. The most common reasons for surgical failure are incomplete or improper removal of the TM, wrong site ablation that damages the ciliary body band when mistaken for the TM, or damage to the SC or surrounding tissue which results in wound healing processes. The most common postoperative complication that occurs in almost 100% of the cases is reflux of blood from the collector channels, however, surgical intervention for hyphema is rare. PAS is also somewhat common , as it has been observed in up to nearly a quarter of patients in some studies, but can be remedied by laser or photocoagulation treatment. Consistent with other types of MIGS, postoperative IOP spikes of 10 mmHg or higher have been observed in 4-10% of cases,[1, 28] although they typically resolve without the need for further operations. For example, one study found that 9% of patients had IOP spikes on day 1 post-operation, while only 2% maintained the spike at day 7. Other rare complications (<1%) reported in the literature include transient hypotony, lens injury, cyclodialysis cleft, aqueous misdirection, and choroidal hemorrhage. [6, 26] There are no known reported cases where Trabectome has been directly implicated in loss of 2 lines or greater of Snellen visual acuity. American Academy of Ophthalmology. Glaucoma: Angle based surgery: Ab interno trabeculotomy (Trabectome), canaloplasty, trabecular micro-bypass (iStent) Practicing Ophthalmologists Learning System, 2017 - 2019 San Francisco: American Academy of Ophthalmology, 2017. 1. Ting, J. L. M., Damji, K. F., Stiles, M. C., and Trabectome Study Group. “Ab Interno Trabeculectomy: Outcomes in Exfoliation versus Primary Open-Angle Glaucoma” Journal of cataract and refractive surgery 38, no. 2 (2012): 315–323. 2. Francis, B. A., See, R. F., Rao, N. A., Minckler, D. S., and Baerveldt, G. “Ab Interno Trabeculectomy: Development of a Novel Device (TrabectomeTM) and Surgery for Open-Angle Glaucoma” Journal of glaucoma 15, no. 1 (2006): 68. 3. Kaplowitz, K., Bussel, I. I., Honkanen, R., Schuman, J. S., and Loewen, N. A. “Review and Meta-Analysis of Ab-Interno Trabeculectomy Outcomes” The British journal of ophthalmology 100, no. 5 (2016): 594–600. 5. Minckler, D., Baerveldt, G., Ramirez, M. A., Mosaed, S., Wilson, R., Shaarawy, T., Zack, B., Dustin, L., and Francis, B. “Clinical Results with the Trabectome, a Novel Surgical Device for Treatment of Open-Angle Glaucoma” Transactions of the American Ophthalmological Society 104, (2006): 40–50. 6. Kaplowitz, K., Schuman, J. S., and Loewen, N. A. “Techniques and Outcomes of Minimally Invasive Trabecular Ablation and Bypass Surgery” The British journal of ophthalmology 98, no. 5 (2014): 579–585. 7. Bussel, I. I., Kaplowitz, K., Schuman, J. S., Loewen, N. A., and Trabectome Study Group. “Outcomes of Ab Interno Trabeculectomy with the Trabectome after Failed Trabeculectomy” The British journal of ophthalmology 99, no. 2 (2015): 258–262. 8. Tojo, N., Abe, S., Miyakoshi, M., and Hayashi, A. “Comparison of Intraocular Pressure Fluctuations before and after Ab Interno Trabeculectomy in Pseudoexfoliation Glaucoma Patients” Clinical ophthalmology 11, (2017): 1667–1675. 9. Akil, H., Chopra, V., Huang, A., Loewen, N., Noguchi, J., and Francis, B. A. “Clinical Results of Ab Interno Trabeculotomy Using the Trabectome in Patients with Pigmentary Glaucoma Compared to Primary Open Angle Glaucoma” Clinical & experimental ophthalmology 44, no. 7 (2016): 563–569. 10. Kaplowitz, K. and Loewen, N. A. “Trabectome-Mediated Ab Interno Trabeculectomy for Secondary Glaucoma or as a Secondary Procedure” Advanced Glaucoma Surgery (2015): 15–29. 11. Dang, Y., Kaplowitz, K., Parikh, H. A., Roy, P., Loewen, R. T., Francis, B. A., and Loewen, N. A. “Steroid-Induced Glaucoma Treated with Trabecular Ablation in a Matched Comparison with Primary Open-Angle Glaucoma” Clinical & experimental ophthalmology 44, no. 9 (2016): 783–788. 12. Bussel, I. I., Kaplowitz, K., Schuman, J. S., Loewen, N. A., and Trabectome Study Group. “Outcomes of Ab Interno Trabeculectomy with the Trabectome by Degree of Angle Opening” The British journal of ophthalmology 99, no. 7 (2015): 914–919. 13. Mosaed, S., Chak, G., Haider, A., Lin, K. Y., and Minckler, D. S. “Results of Trabectome Surgery Following Failed Glaucoma Tube Shunt Implantation: Cohort Study” Medicine 94, no. 30 (2015): e1045. 15. Minckler, D., Mosaed, S., Dustin, L., Ms, B. F., and Trabectome Study Group. “Trabectome (trabeculectomy-Internal Approach): Additional Experience and Extended Follow-Up” Transactions of the American Ophthalmological Society 106, (2008): 149–59; discussion 159–60. 18. Sit, A. J., Ekdawi, N. S., Malihi, M., and McLaren, J. W. “A Novel Method for Computerized Measurement of Episcleral Venous Pressure in Humans” Experimental eye research 92, no. 6 (2011): 537–544. 19. Jea, S. Y., Francis, B. A., Vakili, G., Filippopoulos, T., and Rhee, D. J. “Ab Interno Trabeculectomy versus Trabeculectomy for Open-Angle Glaucoma” Ophthalmology 119, no. 1 (2012): 36–42. 20. Loewen, R. T., Roy, P., Parikh, H. A., Dang, Y., Schuman, J. S., and Loewen, N. A. “Impact of a Glaucoma Severity Index on Results of Trabectome Surgery: Larger Pressure Reduction in More Severe Glaucoma” PloS one 11, no. 3 (2016): e0151926. 21. Dang, Y., Roy, P., Bussel, I. I., Loewen, R. T., Parikh, H., and Loewen, N. A. “Combined Analysis of Trabectome and Phaco-Trabectome Outcomes by Glaucoma Severity” F1000Research 5, (2016): 762. 22. Dang, Y., Waxman, S., Wang, C., Parikh, H. A., Bussel, I. I., Loewen, R. T., Xia, X., Lathrop, K. L., Bilonick, R. A., and Loewen, N. A. “Rapid Learning Curve Assessment in an Ex Vivo Training System for Microincisional Glaucoma Surgery” Scientific reports 7, no. 1 (2017): 1605. 23. Brandão, L. M. and Grieshaber, M. C. “Update on Minimally Invasive Glaucoma Surgery (MIGS) and New Implants” Journal of ophthalmology 2013, (2013): 705915. 24. Vold, S. D. “Ab Interno Trabeculotomy With the Trabectome System: What Does the Data Tell Us?” International ophthalmology clinics 51, no. 3 (2011): 65. 25. Neiweem, A. E., Bussel, I. I., Schuman, J. S., Brown, E. N., and Loewen, N. A. “Glaucoma Surgery Calculator: Limited Additive Effect of Phacoemulsification on Intraocular Pressure in Ab Interno Trabeculectomy” PloS one 11, no. 4 (2016): e0153585. 26. Fallano, K., Bussel, I., Kagemann, L., Lathrop, K. L., and Loewen, N. “Training Strategies and Outcomes of Ab Interno Trabeculectomy with the Trabectome” F1000Research 6, (2017): 67. 27. Ngai, P., Kim, G., Chak, G., Lin, K., Maeda, M., and Mosaed, S. “Outcome of Primary Trabeculotomy Ab Interno (Trabectome) Surgery in Patients with Steroid-Induced Glaucoma” Medicine 95, no. 50 (2016): e5383. 28. Francis, B. A. and Winarko, J. “Ab Interno Schlemm’s Canal Surgery: Trabectome and I-Stent” Developments in ophthalmology 50, (2012): 125–136. 29. Francis, B. A., Minckler, D., Dustin, L., Kawji, S., Yeh, J., Sit, A., Mosaed, S., Johnstone, M., and Trabectome Study Group. “Combined Cataract Extraction and Trabeculotomy by the Internal Approach for Coexisting Cataract and Open-Angle Glaucoma: Initial Results” Journal of cataract and refractive surgery 34, no. 7 (2008): 1096–1103. This page was last modified on December 11, 2018, at 17:01.